This picture shows the aftermath of a fire in one of our local neighborhoods. Luckily, the fire only affected a portion of the house. However, it is severe enough that are SERVPRO team has been there everyday to help make the house look as good as new! We are faster to any disaster and we are here to help make it "Like it never even happened." 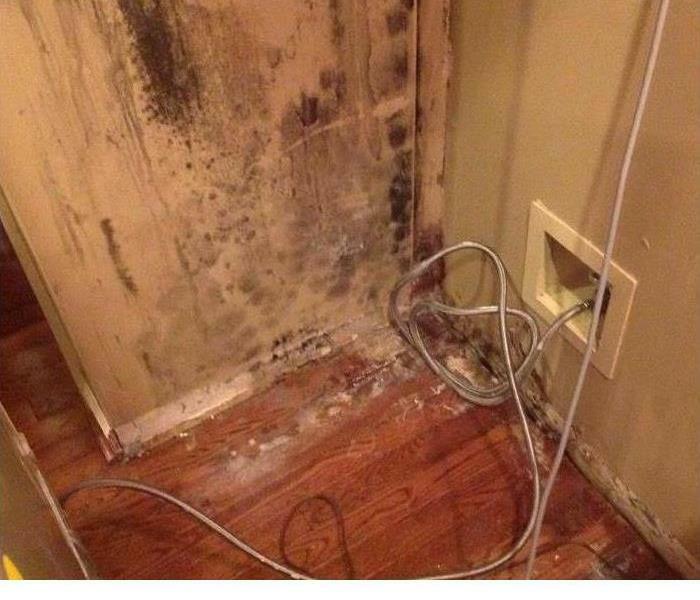 When it comes to mold, most people have one word on their minds...YUCK! Well at SERVPRO when we hear mold we get to work! We are faster to any disaster, including ones that involve mold, and our goal is always to make it "Like it never even happened." SERVPRO® of Kosciusko & Noble Counties is always here to help! Whether in Warsaw, Wabash, Syracuse, Huntington, Columbia City, Milford or surrounding areas, we are here to make it "Like it never even happened." for you! Can you imagine coming home to this after some time away? 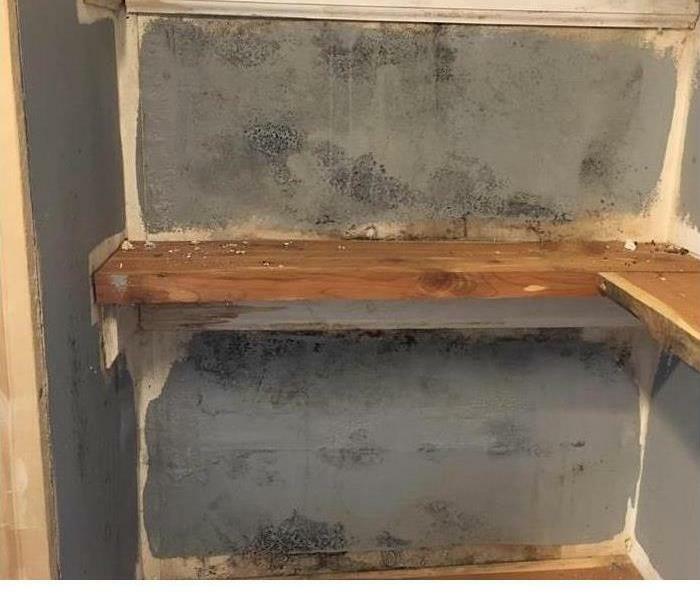 This couple returned after a long vacation to find mold behind their fridge. First we removed the molded materials and then set up drying equipment. We are faster to any disaster and we are here to make it "Like it never even happened." After a severe storm that involves flooding and water damage, there could be evidences of mold beginning to grow. 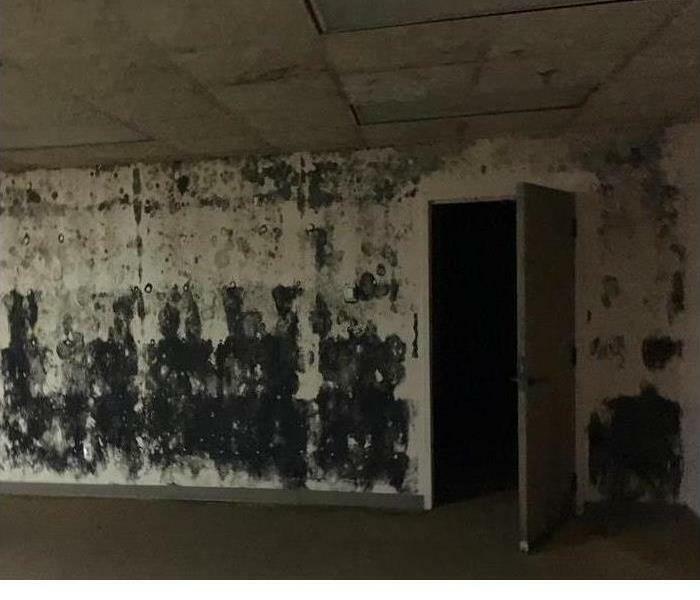 In this picture, it shows the mold that began to grow on the ceiling and wall of a commercial building. 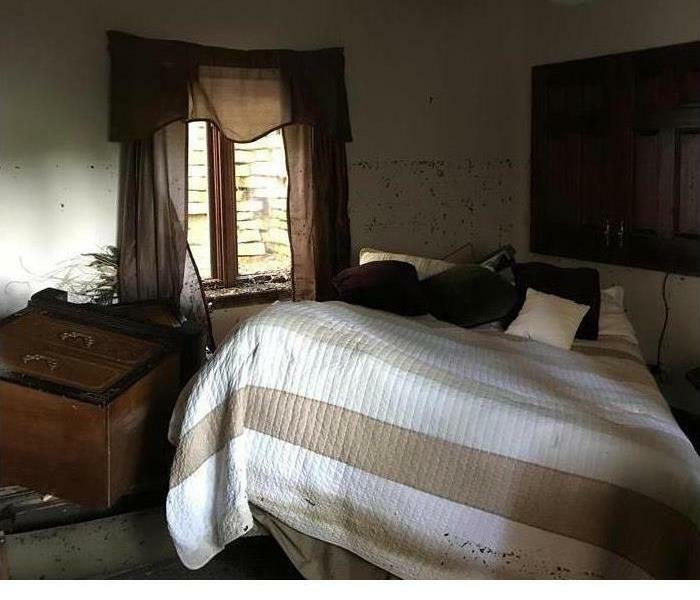 This is a bedroom with severe water damage that turned into Mold on the walls from the damage. It is critical for SERVPRO to contain the mold to help keep from spreading to other rooms of the home. SERVPRO of responded to this emergency with Mold. The walls were covered in mold so the restoration team came in and tore drywall down and put plastic up on walls to contain the Mold to one room. SERVPRO is called in any emergency service 24 hours a day 7 days a week. This is the aftermath of Mold damaging the ceiling after water damage. The teams are trained and knowledgeable of all treatments for mold. SERVPRO has your mold needs covered. Mold can spread quickly and can be in places you may never see. 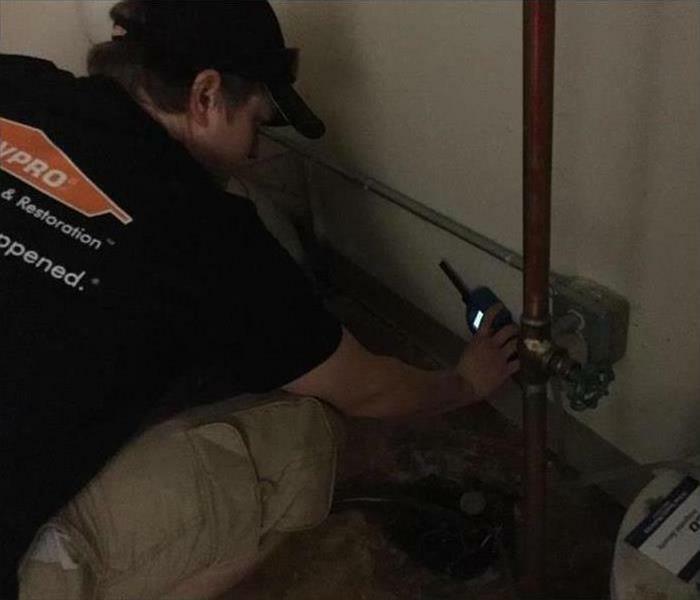 SERVPRO has the right people trained and the right equipment ready for any of your mold needs. No Commercial Job Too Big Or Small! We will do any job big or small. Our crews are highly trained and certified. Our crews will come to your commercial property big or small and be professional and courteous whether you are trying to get back to business quicker or whether you are maintaining regular business when you need our services. Give SERVPRO of Kosciusko & Noble Counties a call! 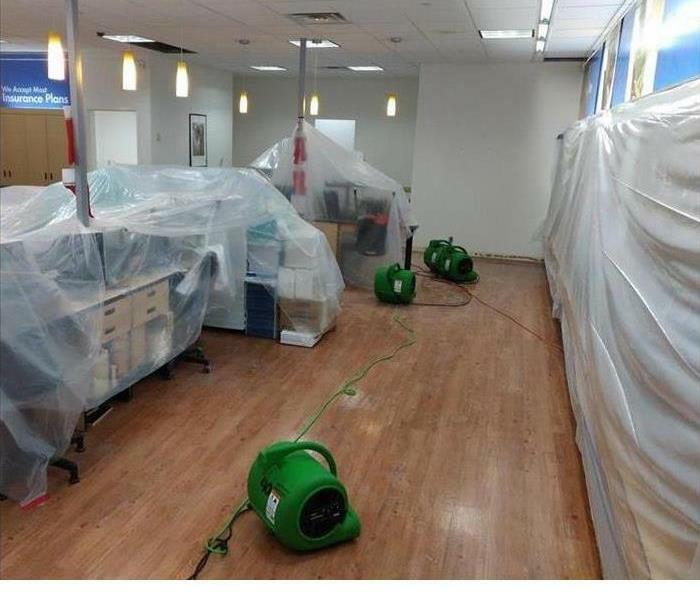 What a containment does when water damage strikes! 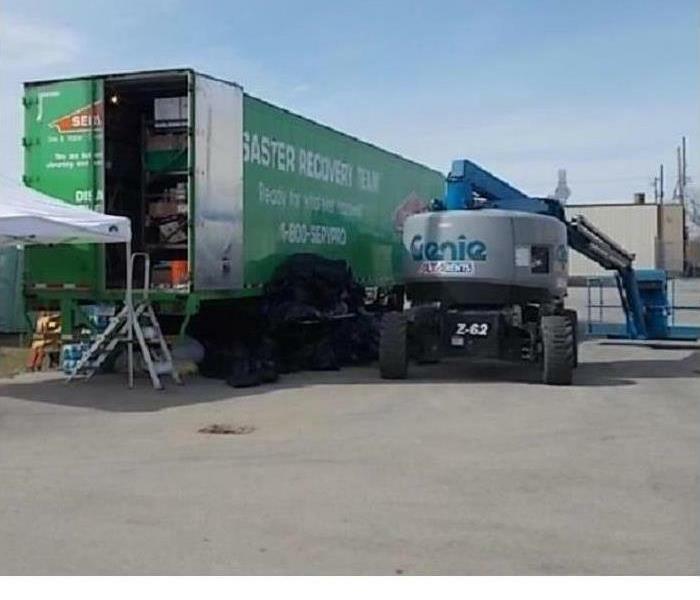 SERVPRO was called out to a flood at a local business & Before the crew started to work, they built a containment around the products and entrance of the business. A containment prevents dust and other unwanted items from collecting on the products. The containment also helps with keeping the customers out of the area until the rebuild is completed. Even though the winter months are in full swing, there is never a bad time to think about trimming those trees up of their hanging limbs or taking some trees down that could be a problem once spring does decide to come. Along with spring comes storms, and frankly a large wind even in these winter months could cause a large problem as seen in this picture. Although this picture clearly shows a beautiful calm day after a storm hit leaving a tree limb through the roof causing water damage in the house it is never too early to think about who you would call and trust in an emergency as such. SERVPRO is available 24/7 in emergencies. Give us a call if you need someone faster to your disaster! Hopefully this coming spring in 2018 will not give us heavy flooding waters caused by storms. 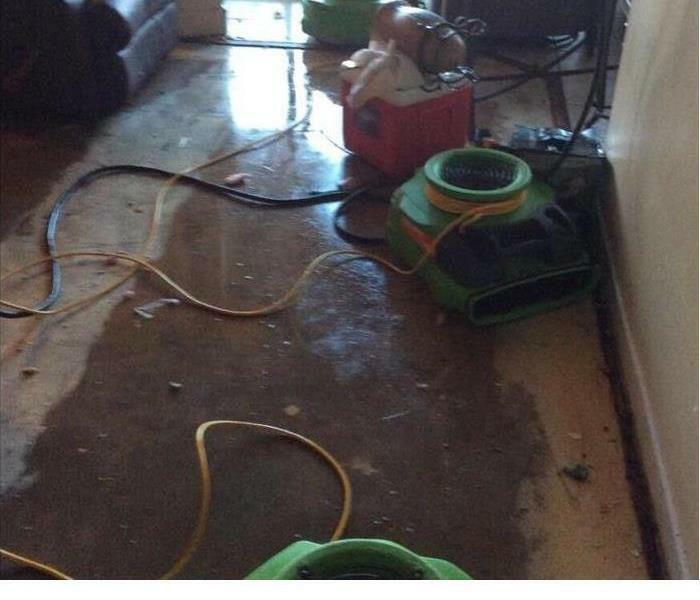 In case your home suffers flood damage, depend on SERVPRO to help mitigate the water and restore your home to its preloss condition. Our certified water experts will properly mitigate and clean up nasty flood waters that may be over your head. 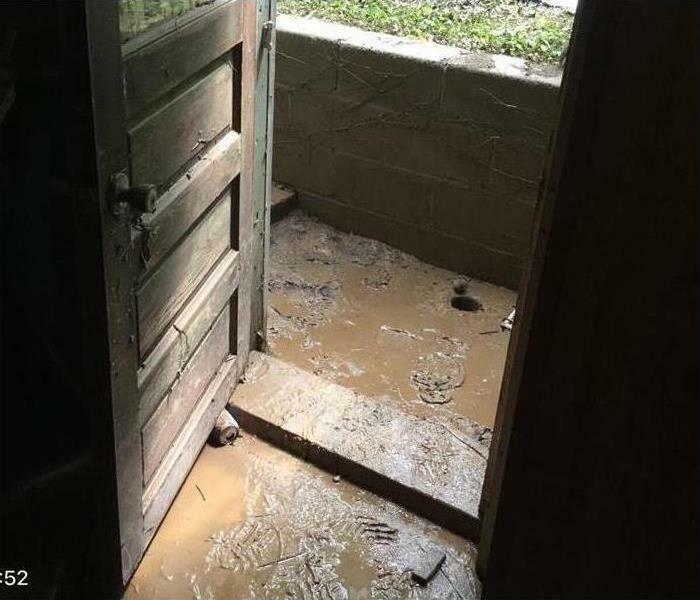 This picture shown here is a house that had flood waters go through there basement leaving a mess that the owners were overwhelmed with. 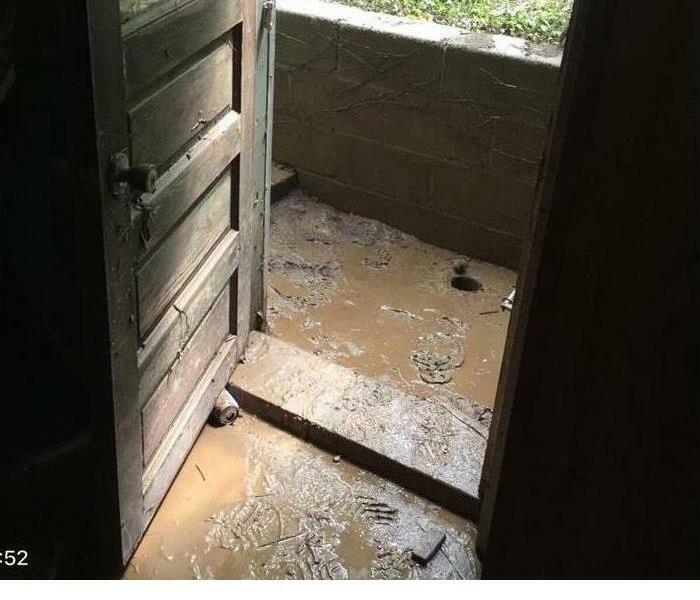 Not only did water come through, as you can see the mud and debris comes with causing a major problem. 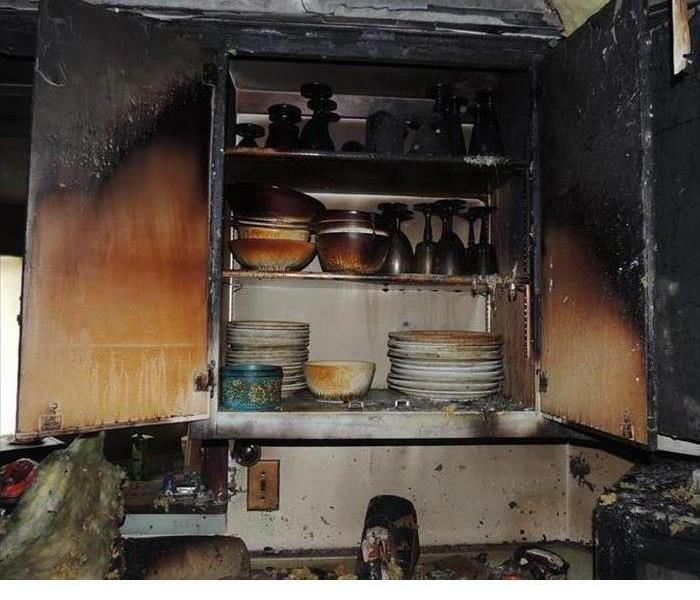 This image shows the aftermath of a kitchen fire. 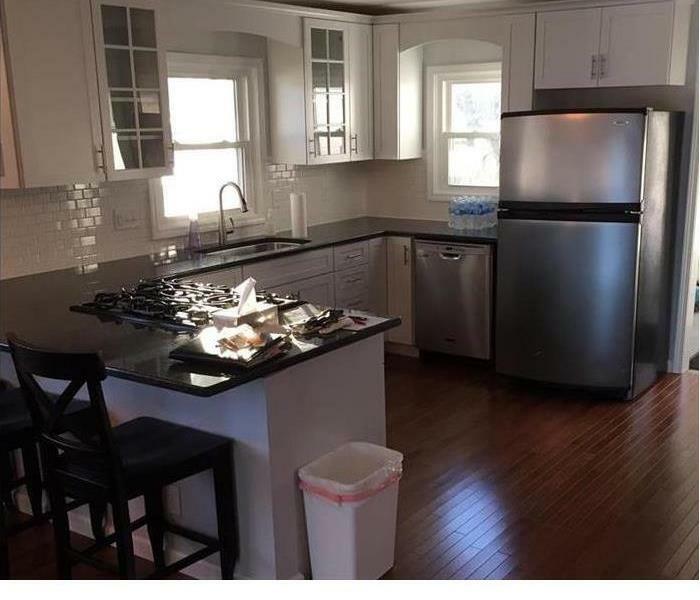 SERVPRO was able to clean and deodorization the kitchen and most of the items in the kitchen. The image is of one of the walls in the kitchen that had significant smoke and soot damage. SERVPRO was able to clean the wall to look white again and remove the smoke smell in the kitchen. SERVPRO was dispatched to a job in this past week to a fire. This fire ended up being a total loss but our crew still had many tasks to do on this jobsite before the home is taken down. The crew performed an inventory list of all items in the house whether salvageable or not. This list includes all items from silverware to furniture and so much more. After the inventory has been completed our staff performed a pack out of the items to bring back to the warehouse for Ozone Treatment and Cleaning of salvageable items. An Ozone Treatment deodorizes, disinfects, and kills or removes dangerous or irritating airborne particles in indoor environments. The crew finished up with cleaning out the house of all the debris that was left from the fire. This picture shows one of our technicians cleaning up debris in a house after a fire. 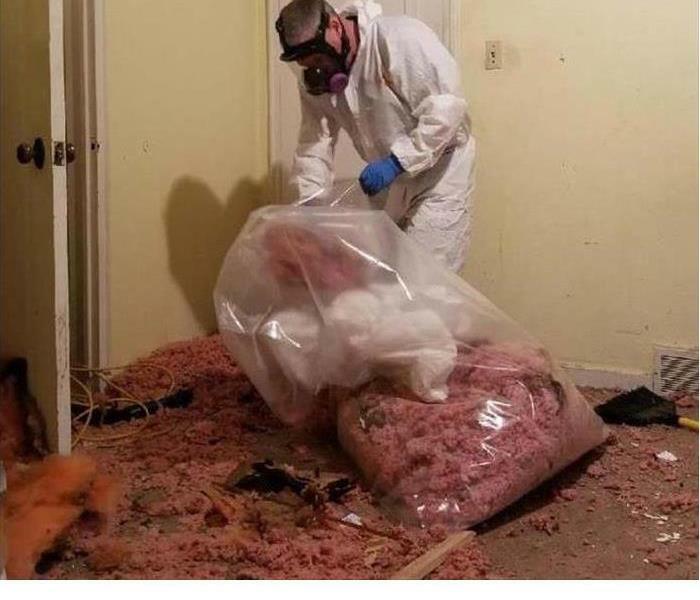 The insulation from the ceiling above and the drywall had to be bagged and removed from the house for disposal. The fire department had broken down the ceiling to get to the ceiling joists in the attic above to check for hot spots. We were called in to clean up the debris. It is important to wear proper personal protective equipment to protect yourself when working with materials possibly affected by fire. We also bag up the materials to contain the mess from being spread through the other work areas. 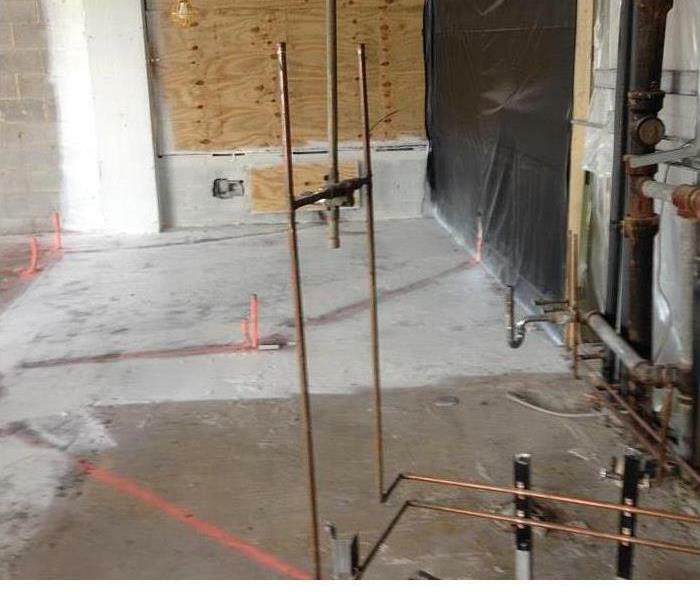 When we are called in to provide water restoration work for a commercial or residential customer we come right away and access the situation and what we need to set up for equipment. The process does not stop there after setting equipment. We come daily and monitor the progress the structure is having to dry out. This picture shows one of our tools we use to access moisture content of the structure. 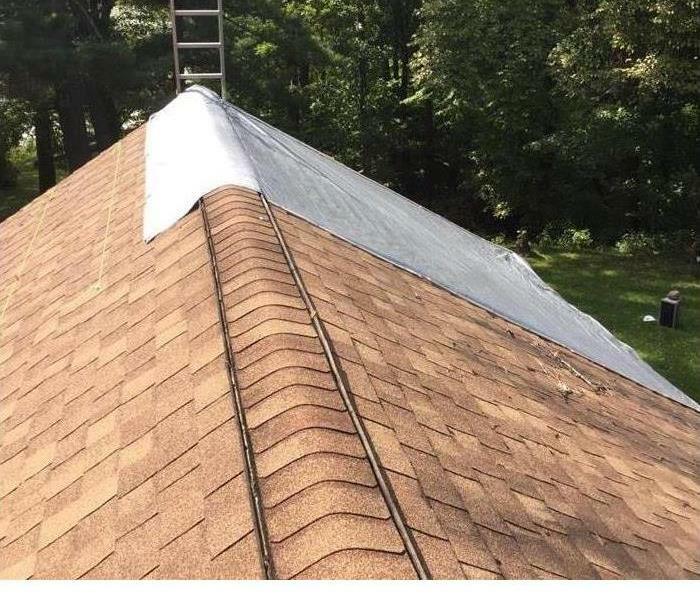 Some times we are able to dry the structure in just a couple of days or a few hours with the correct equipment and depending on the extent of the intrusion. With diligent monitoring we can make equipment changes as needed to dry the structure quickly. 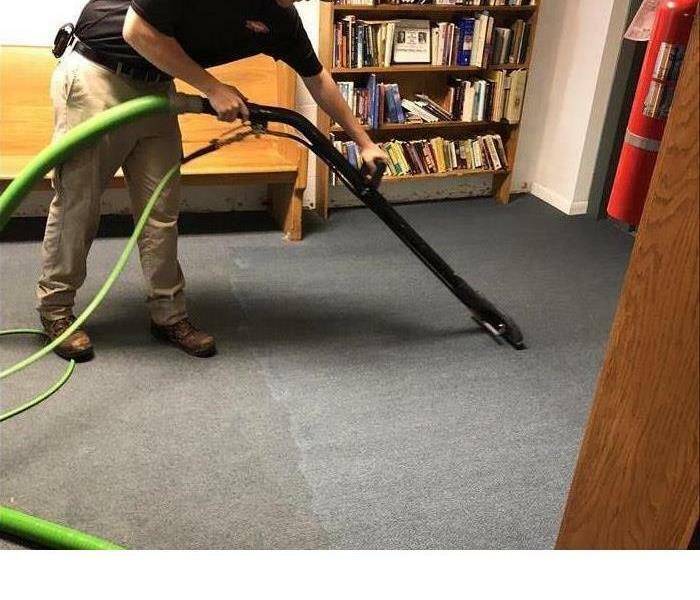 There is a science to drying and we believe in following the process that we are trained in to get your business or home back to business quickly and make it "Like it never even happened." 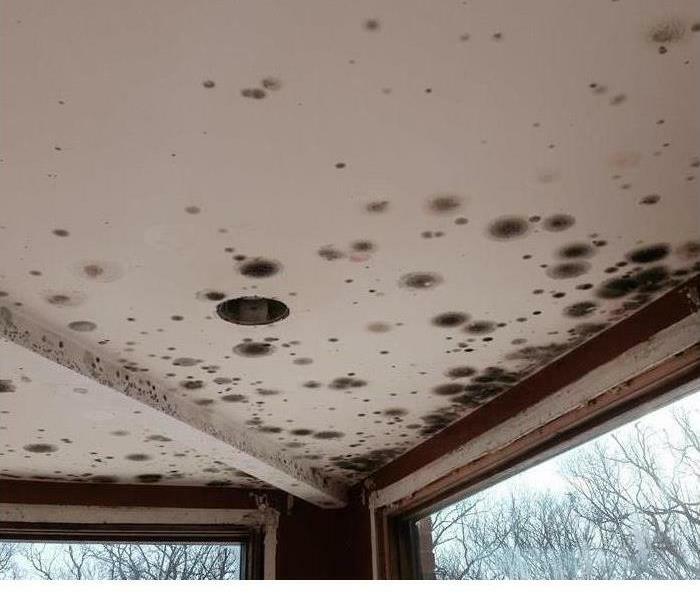 Why SERVPRO when mold hits your business! 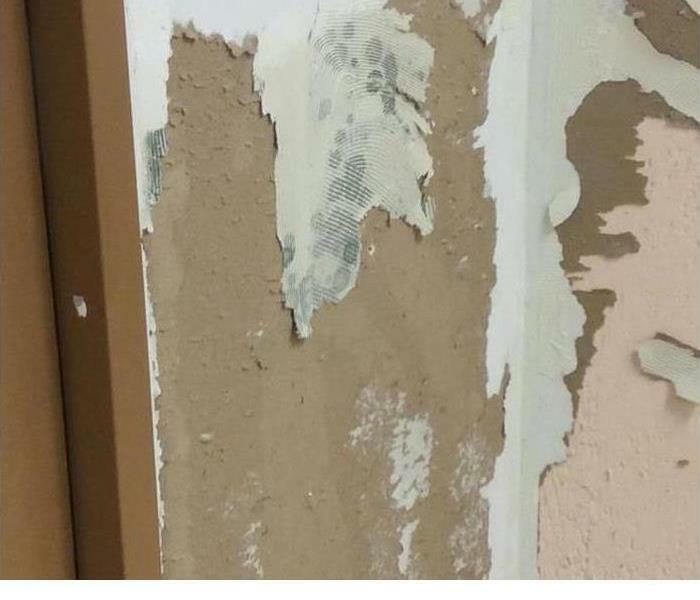 When mold hits your business in Kosciusko or Noble County, it can be devastating! Each day your business is closed you are losing money! Give us a call today at SERVPRO of Kosciusko & Noble Counties! We are faster to any disaster and we will make it "Like it never even happened." Why SERVPRO when you find mold in your Kosciusko business! When mold hits your business in Kosciusko or Noble County, it can be devastating! Each day your budsiness is closed you are losing money! Give us a call today at SERVPRO of Kosciusko & Noble Counties! We are faster to any disaster and we will make it "Like it never even happened." When water damage hits your home, it is important to get as much of the moisture out as possible! That is why you should call us at SERVPRO of Kosciusko & Noble Counties. Often when water affects your basement it can be seen in your drop ceiling! If you see water spots, give us a call at SERVPRO of Kosciusko & Noble Counties! We are faster to any disaster, both small and large, and we can make it "Like it never even happened." Call us today! Storms damage homes in Kosciusko! This home suffered water damage from wind & rain. When storms hit causing flooding in your home, call SERVPRO of Kosciusko & Noble Counties. Highly Trained Water Damage Restoration Specialist. We will come in and make it "Like it never even happened." 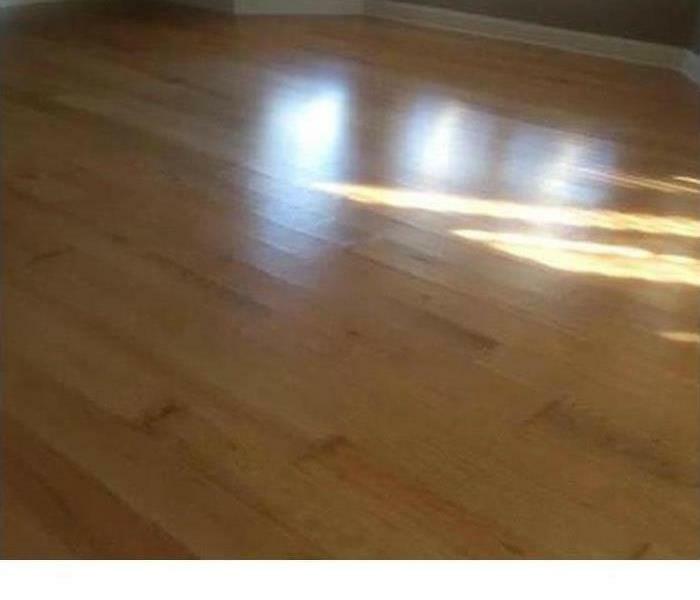 Water Damage or Flooding? Call Us Today (574) 306-4134! An immediate response is vital! When you are dealing with storm, flood, and water damage, immediate action is crucial. You should choose the company with storm damage experience and expertise that has the resources and equipment to handle the job. SERVPRO of Kosciusko & Noble Counties will respond immediately to storm and flooding conditions. We are faster to any disaster and we will make it "Like it never even happened." Have A Water Damage Emergency? Call (574) 306-4134! 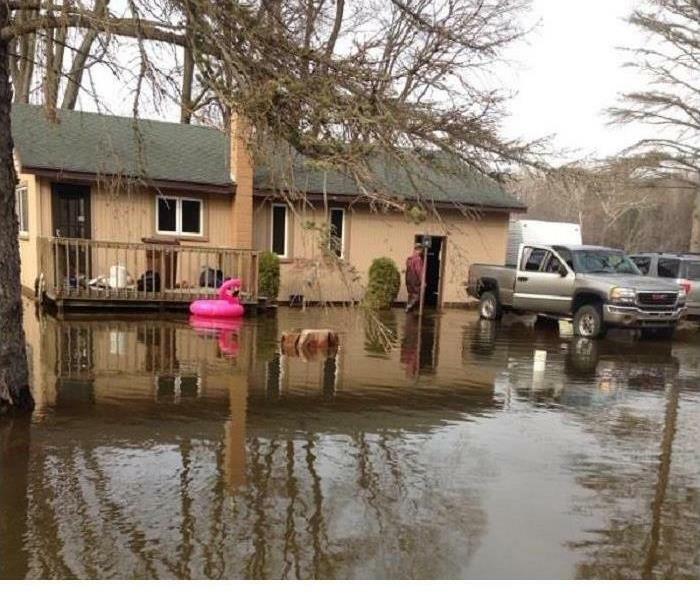 Flooding from storms can be severe! This water has receded 2ft. The inside of the home needs to have damaged materials and equipment removed. 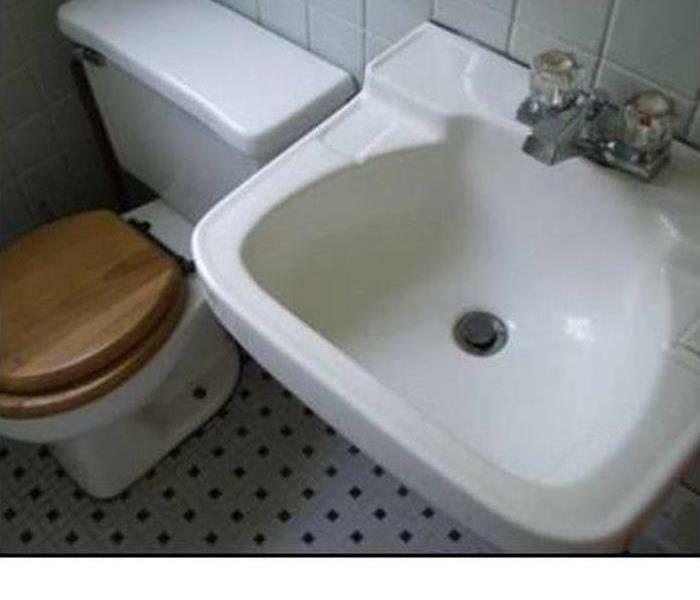 Then it needs to be dried and sanitized prior to a remodel. SERVPRO of Kosciusko & Noble Counties is here to help! We are faster to any disaster and we will make it "Like it never even happened." Regional storms can require massive cleanup efforts with trained labor. Recent flooding necessitated many people working around the clock to clean homes and businesses. SERVPRO has the resources to help! We are faster to any disaster! We can come and make it "Like it never even happened." 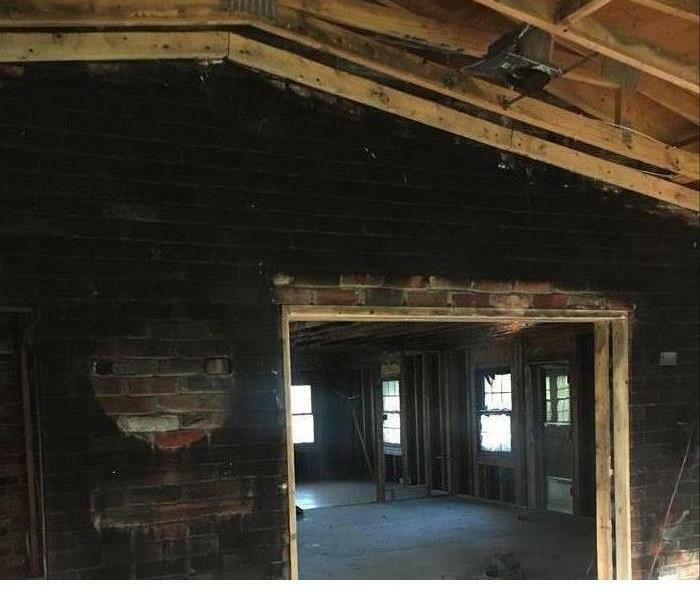 Fire Hits Where It Wants To! The fire happened Saturday morning December 30 around 5 AM. 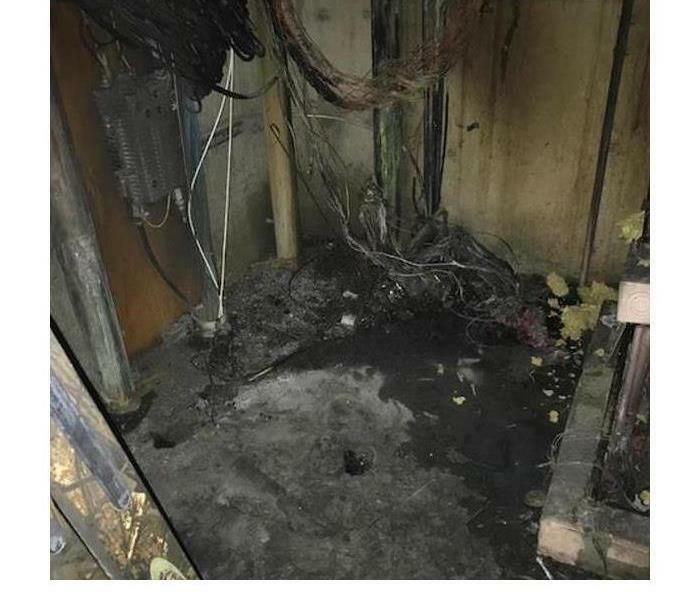 This was an electrical fire in three separate mechanical rooms on the 23rd, 22nd, 21st floor. Smoke damages to the 20th, 21st, 22nd, 23rd, 24th floors. Overall around 90 hotel rooms affected. Along with hallways, storage rooms, and common areas. SERVPRO crews worked through the holiday weekend cleaning and deodorizing and were able to turn some of the affected rooms in time for their busy New Year's eve celebration. 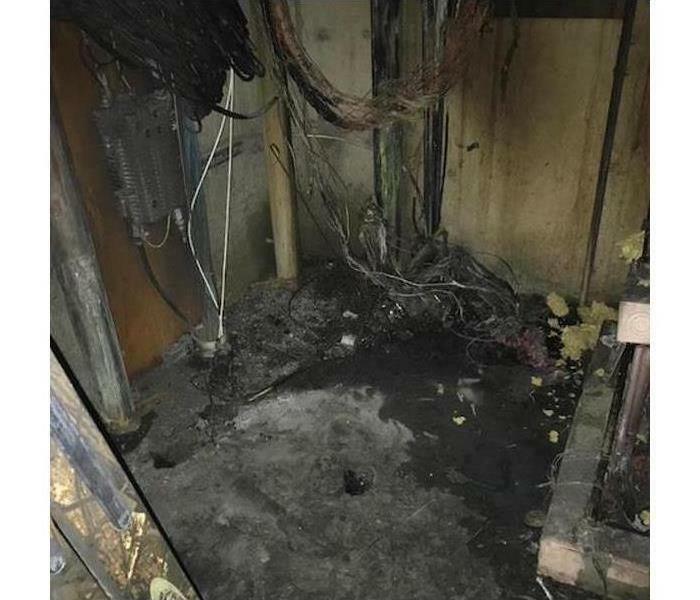 A hotel suffered an electrical fire and multiples rooms/floors were covered with soot. 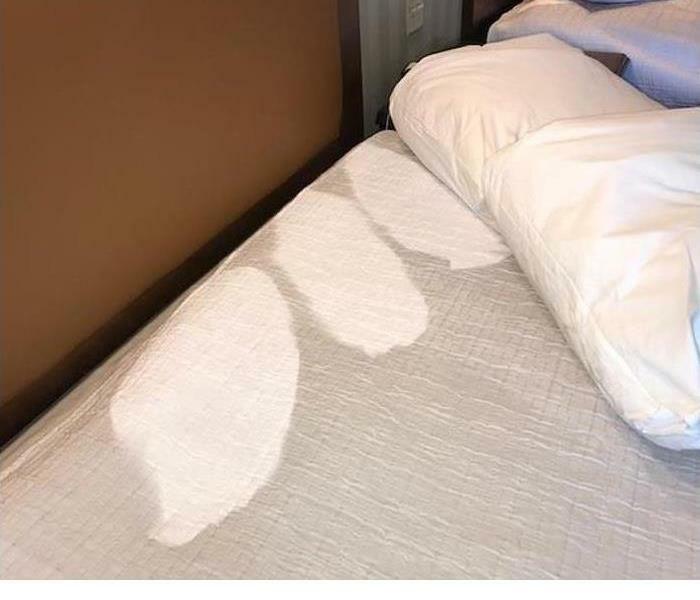 Our team of professionals cleaned and restored the hotel rooms quickly and safely. If disaster strikes your home or place of work, call us! We are faster to any disaster and we will make it "Like it never even happened." The water damage seen in this photo is coming from the garage ceiling of this home. 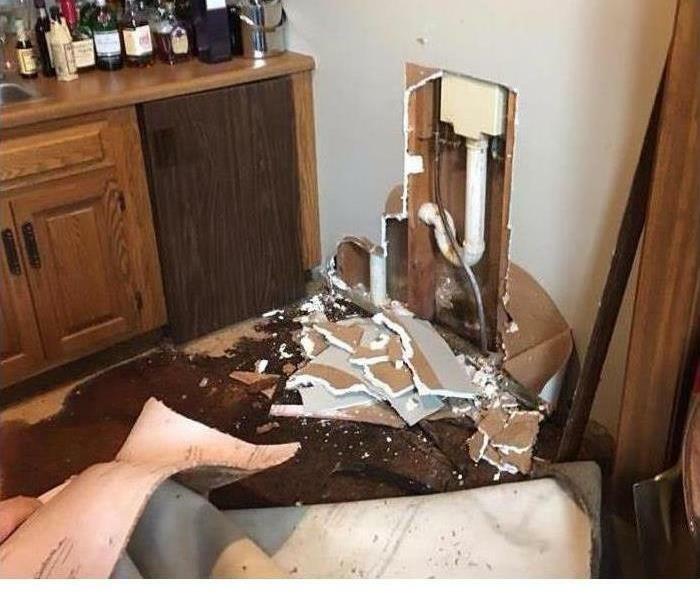 An upstairs bathroom faucet leak inside the wall caused the damage shown here. Water leaks and the damage they cause can happen at anytime and just about anywhere. The water supply lines in a typical home are under have continuous pressure, and if there’s a leak or break, water will run out until it’s shut off or fixed. Small leaks inside walls are notorious for causing a lot of damage. These leaks are often slow and gradual, so damage builds up and compounds itself over a period of time. 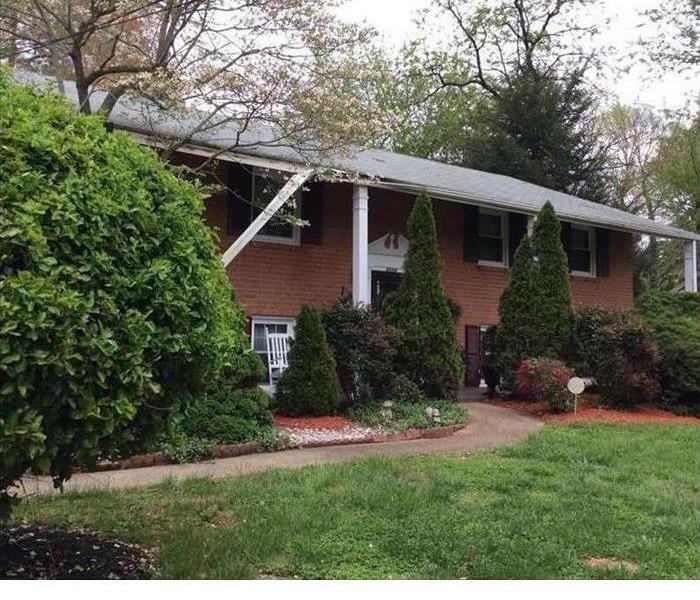 Typically, home-owners don’t see the problem until it’s too late. When you find water damage in your home, don’t panic! Call us today! This kitchen fire in Indianapolis caused severe damage to the home. The debris on the countertops is the ceiling drywall and insulation. 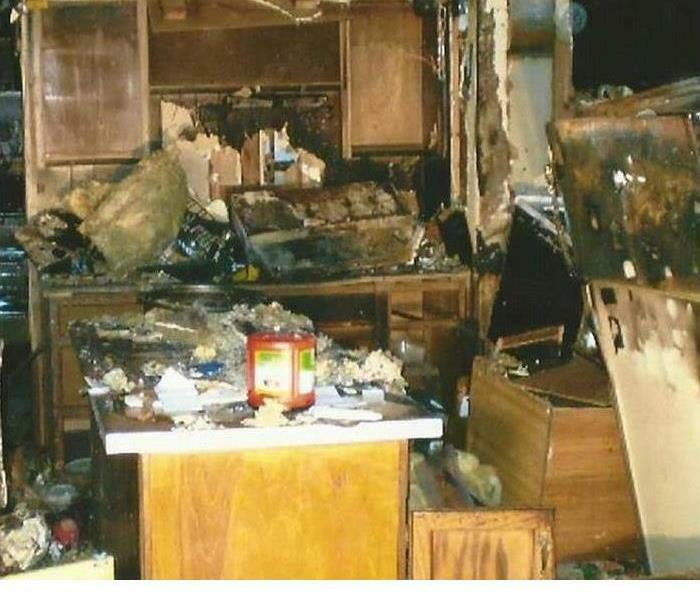 The fire started on the stove behind the refrigerator and burned the wall and ceiling. The smoke and heat were so intense that as a result, the kitchen cabinets, countertops, walls and floors all needed removed and replaced. 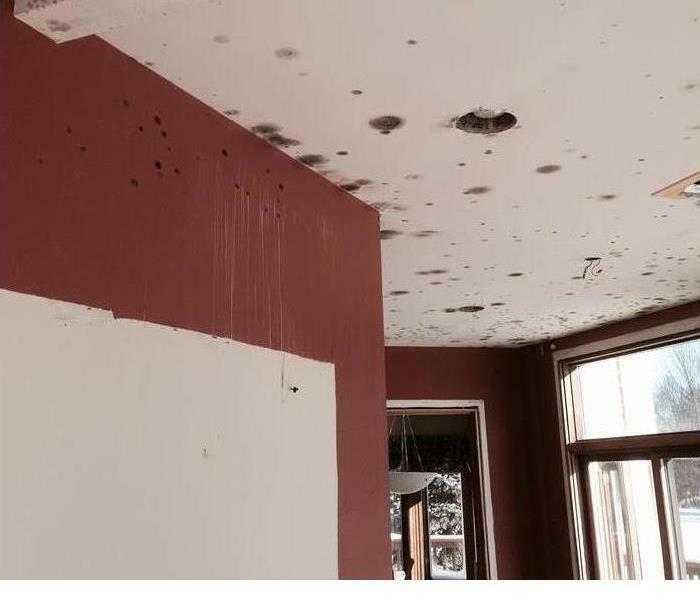 One of the many benefits of working with SERVPRO of Kosciusko & Noble Counties is that we manage every aspect of fire damage restoration, from your very first call to us, to final walk-through. You, the homeowner, have only one contact during the entire process. We oversee every step to get you back into your home as quickly as possible. Why SERVPRO when it comes to mold and abandoned buildings! Abandoned buildings can be a prime place to find mold growth. The building pictured had a serious roof leak for an extended period causing mold to grow in stripes along the walls and ceilings. If you have a serious mold problem call the professionals at SERVPRO of Kosciusko & Noble Counties at (574) 306-4134. A Slow Leak Is Still A Leak! Slow leaks can sometimes be hard to catch. Ongoing issues can sometimes lead to mold growth. The recommended remediation process is to remove affected drywall and sometimes flooring before drying can begin. It is nearly impossible to clean the paper face of the affected drywall without destroying the material in the process. 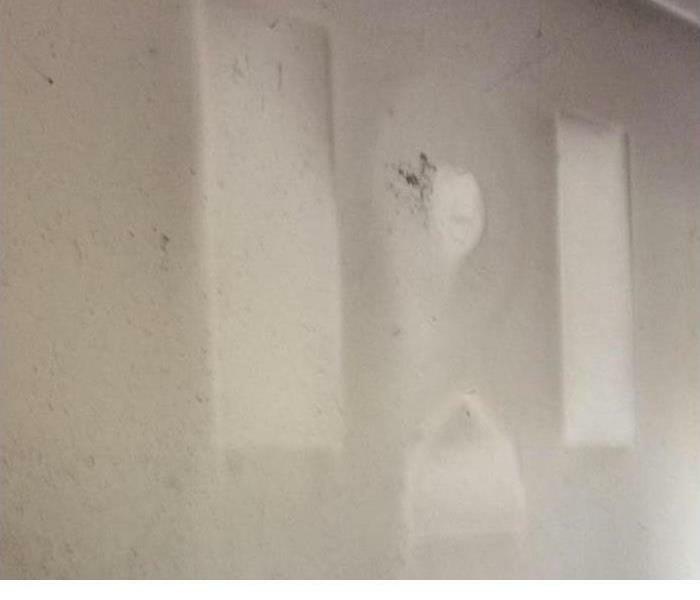 In the case of this picture, a slow leaking washing machine caused mold to grow on the surrounding drywall. Luckily these homeowners called us and we had it all cleaned up and drying out in no time. If you have possible mold problems, call SERVPRO of Kosciusko & Noble Counties at (574) 306-4134. 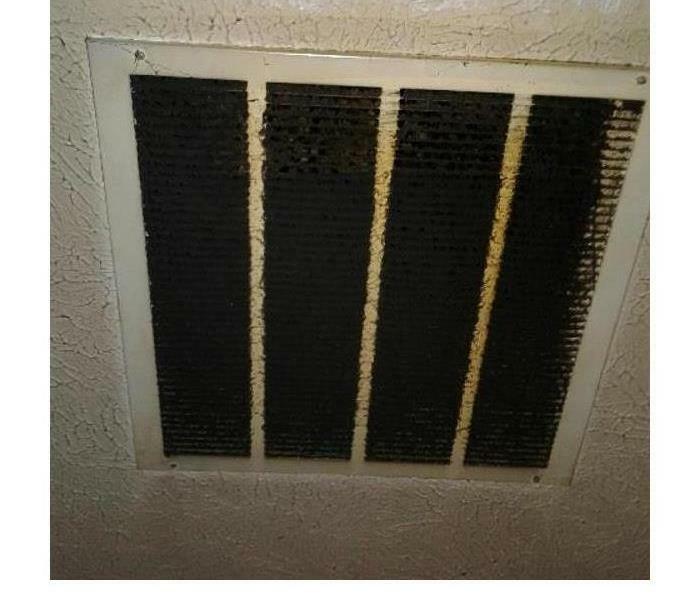 It is incredible how much soot and smoke can get sucked in by a vent in a residential HVAC system during a fire. Depending on the location of the opening in relation to the fire, a return can circulate the smoke throughout the house causing more damage. For this reason a complete cleaning of the duct system is usually required to keep from recirculating airborne smoke and soot throughout the house. Generally a good indicator for if the system needs to be cleaned is by taking a look at the filter. For duct cleaning after a fire, or anytime, call SERVPRO of Kosciusko & Noble Counties at (574) 306-4134. When the Sump Pump, Doesn't! When storms carry heavy rains into an area for an extended period of time it can put a strain on your home's sump pump system. 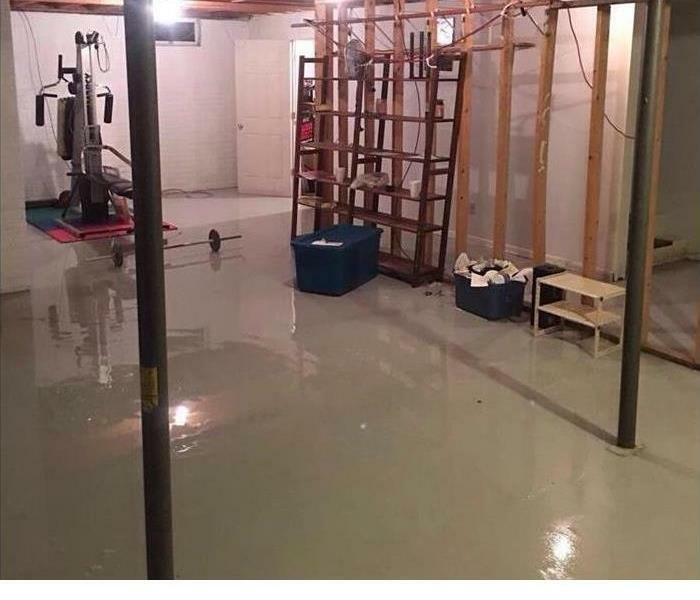 In some cases the amount of water draining into the sump pit will overwhelm the pump causing the water to enter other areas of the basement. In this case the sump was still in working condition but was unable to keep up with the volume of water. In these cases it is sometimes best to wait for the incoming water to slow or place a secondary pump to help get the water out as quickly as possible. This image was taken after we restored this kitchen from a water damage event. Call us at SERVPRO of Kosciusko & Noble Counties! We are faster to any disaster and we will make it "Like it never even happened." Why SERVPRO when it comes to getting back to no more mold! This image was captured after SERVPRO did a cleanup job of a mold issue in this bathroom. Call us at SERVPRO of Kosciusko & Noble Counties! We are faster to any disaster and we will make it "Like it never even happened." Why SERVPRO after the cleanup! This pic is an image after SERVPRO did a cleanup job involving mold. Call us at SERVPRO of Kosciusko & Noble Counties! We are faster to any disaster and we will make it "Like it never even happened." 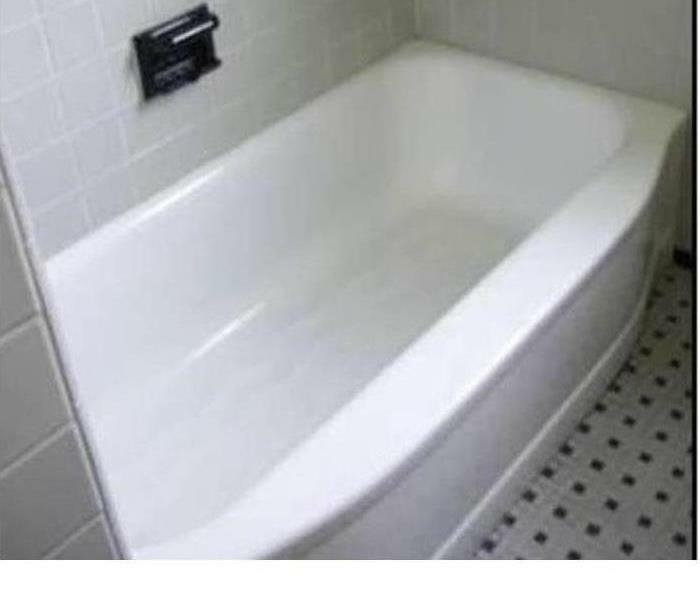 This image is a before we rehabbed pic after a water damage occurred. Call us at SERVPRO of Kosciusko & Noble Counties! We are faster to any disaster and we will make it "Like it never even happened." 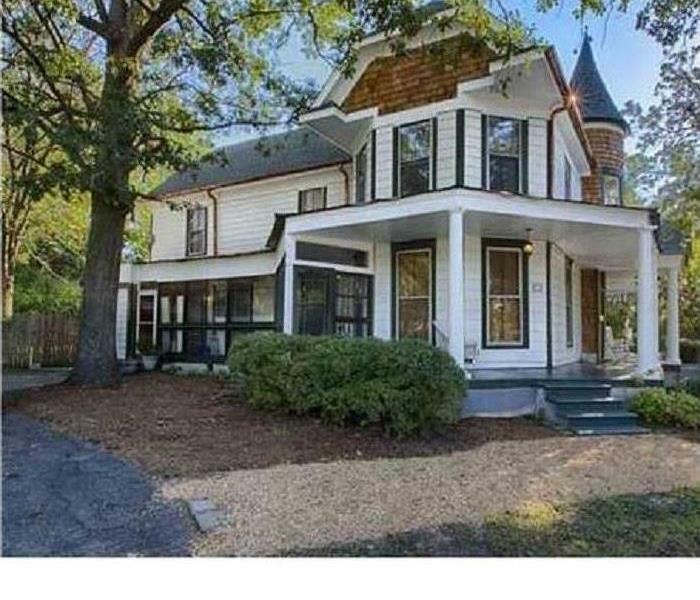 This beautiful historic home is the after image from work that was done to rehab it after a fire. Call us at SERVPRO of Kosciusko & Noble Counties! We are faster to any disaster and we will make it "Like it never even happened."